The rack-mounted CheckVideo HD Video Storage Server (CVNVR-SVR) complements your CheckVideo cameras, offering high resolution 24×7 on-site recording for long durations. Instead of using IP edge recording capabilities on the camera, video is recorded directly to the CVNVR-SVR. The HD Video Storage Server comes in three different capacities of 24TB, 32TB, and 40TB. The rack-mounted CheckVideo HD Video Storage Server (CVNVR-SVR) complements your CheckVideo cameras, offering high resolution 24×7 on-site recording for long durations. Instead of using IP edge recording capabilities on the camera, video is recorded directly to the CVNVR-SVR. Featuring server-class components in a compact 1U rack mount chassis, the HD Video Storage Server ensures that your video is secured. It comes with four video-grade hard drives pre-configured with RAID 5 for increased reliability. The HD Video Storage Server comes in three different capacities of 24TB, 32TB, and 40TB. Combined with patented video compression technology included in all CheckVideo cameras, the CVNVR-SVR is capable of recording 32 channels of 4 megapixel video for 30 days. 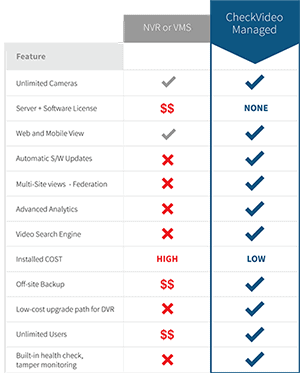 As an added benefit, the CVNVR-SVR is automatically enrolled into CheckVideo’s CloudVMS™ for remote setup, software updates, diagnosis, and health monitoring.